Psalms for All Seasons: A Complete Psalter for Worship contains musical settings for each Psalm as well as Canticles from the Bible and Services of Prayer. For each setting found in this collection, you will find additional resources on this website. We have listed copyright information for each setting, as well as how to legally reprint each setting for use in a worship setting. There are also a wide variety of performance notes, other arrangements, and much more available for each setting. 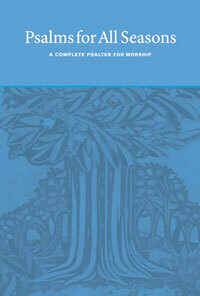 Trees, on page 2 of the hymnal serves as an introduction to the psalter. It is a compilation of Psalms 1, 26, 52, and 92. Reproductions of this song are permitted with a current CCLI or OneLicense.net license, or by contacting the copyright holder. Visit hymnary.org for more information on this song and additional resources.